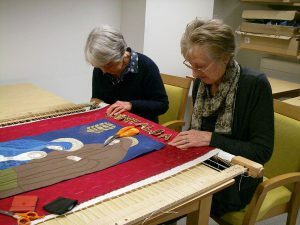 From the conservation of books to projects in historic parks and gardens, Heritage Volunteers from The Arts Society are busy all over the UK helping to conserve and protect the nation’s heritage. They work in many different roles including book conservators, stewards and archivists in heritage sites. If heritage is your passion and you want to make a difference, this might be the role for you. Working closely with the curators and volunteering managers of museums, archives, gardens and historic houses, you will get to spend time in these wonderful places as part of the team. 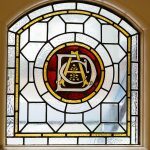 The Arts Society can also provide grants towards heritage projects such as the restoration of the stained glass windows at Undershaw, Sir Arthur Conan-Doyle’s residence in Hindhead. 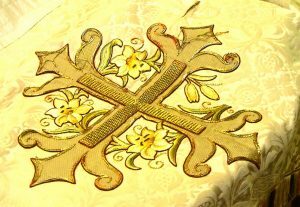 The project consists of lifting goldwork embroidery from an old school chapel altar frontal and positioning the gold work on to new damask to create a new frontal for the school. The back will be lined with blue damask, making it reversable. 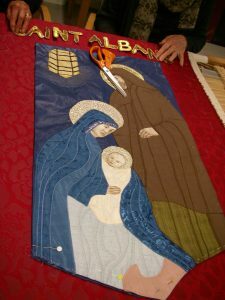 The first Sunday of Advent is a special date in the Church Calendar but also for our Heritage Volunteers and everyone associated with their Kneelers Project. 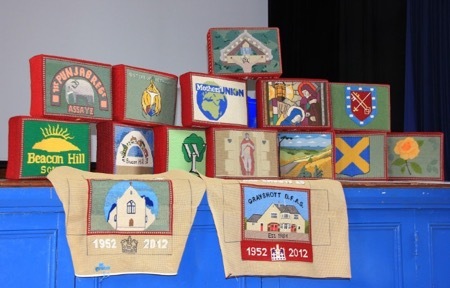 In 2012, to commemorate the Queen’s Diamond Jubilee, the Vicar of St Albans in Hindhead requested some new kneelers for his church. 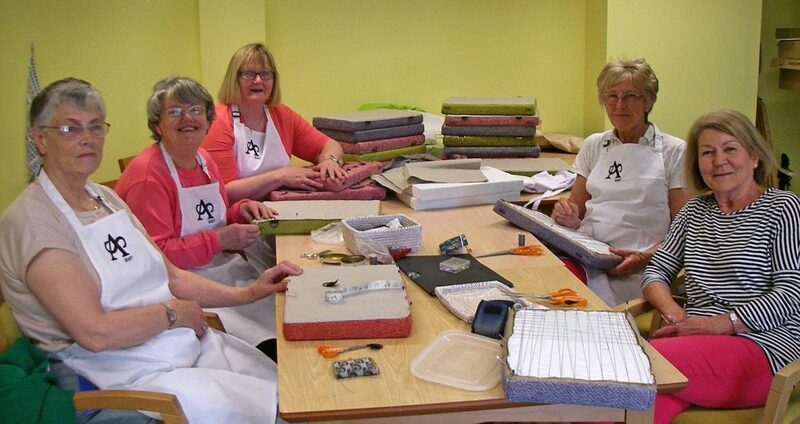 The project received a start-up grant from NADFAS with the condition that St Albans match the funding. 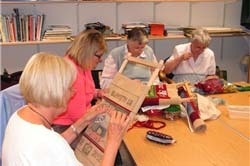 Designs featured on the kneelers would come from our local area and themes associated with it and St Albans. 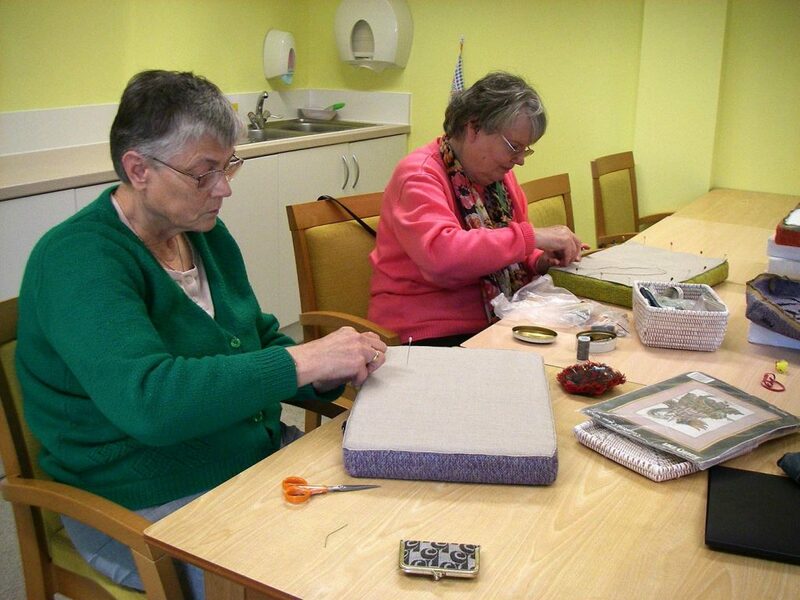 Stitching started in February 2013 and the ‘stitchers’ met on Wednesday afternoons at Manormead. This project has brought organisations in our community together to provide ‘stitchers’, technical wizardy and sponsorship. 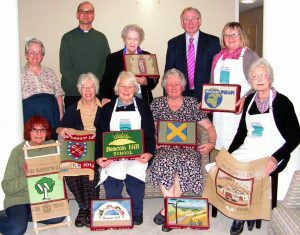 Several talented members of our society and beyond have given their time and expertise and it has highlighted the work of Heritage Volunteers in our area. 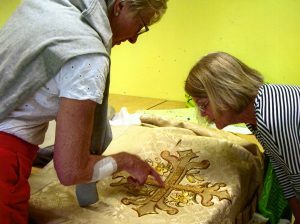 The culmination of all this hard work came with the consecration of the kneelers on 30th November and the opportunity for everyone to see them in an exhibition in St Albans during December. Their completion means we can, in collaboration with Young Art, begin to move forward the plans for Heritage Church Trails designed to appeal to Junior School age children.